Girls with Guns® Clothing brings you the best of both worlds with this reversible puff jacket! Whether you are walking around town or hunting in the woods, this packable, reversible jacket with wind and water resistant, microfiber ripstop material is the perfect accessory for all of your outdoor adventures. Gun metal grey on one side compliments the Mossy Oak® Country camo on the other, and the Primaloft Silver insulation is sure to keep you warm no matter the weather. 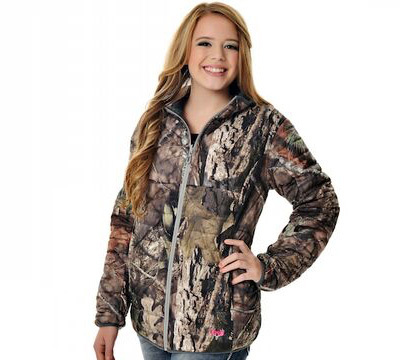 Features include: Reversible Mossy Oak Break Up Country Puff Jacket, Microfiber Ripstop Material to Guarantee Durability, Primaloft Silver Insulation. Made by Realm Brands, LLC. Reversible Side in Charcoal Gray features: Zippered Chest Pocket Handy Side Pocket with Stow Pouch Microfiber Ripstop Material to Guarantee Durability. Primaloft Silver Insulation. LIMITED TO STOCK ON HAND. NO BACKORDERS.